You are here: Home / Cancer / Is Towpath Trail At Cleveland Ohio Steelyard Commons Radioactive From Manhattan Project? 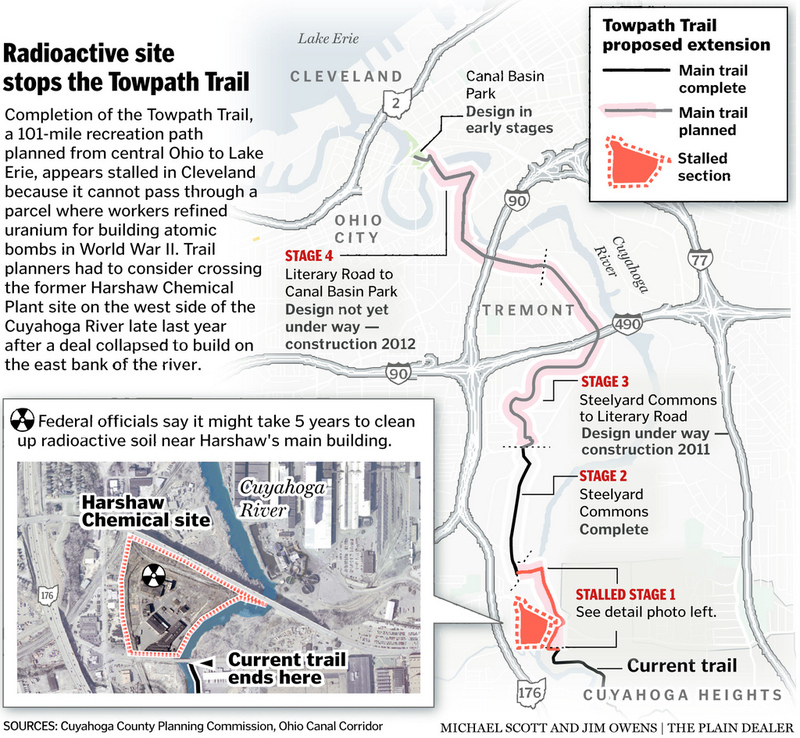 In Cleveland, Ohio, there is only one thing standing in the way of completing the Towpath Trail in the Ohio Canal Corridor and that is radioactive soil. The Towpath Trail – a planned 101-mile path following the historic Ohio & Erie Canal from New Philadelphia through the national park and into Cleveland to the lake – is complete except for one fragment in Cleveland. The U.S. Army Corps of Engineers in a lengthy report January 20 that the site will not host the Towpath Trail anytime soon. It still has radioactive contamination from the refining uranium in World War II. That conclusion was made even though remaining uranium and other radioactive materials in the soil at the former Harshaw Chemical site just south of the Harvard-Denison bridge are not deemed too dangerous to prevent the land being used for passive recreation. The part of the trail that is most contaminated is around ground-zero in the area surrounding 1000 Harvard Avenue. Steelyard Commons shopping center is just north of the Harshaw site, which the towpath traverses behind. I can’t find nothing about testing for radiation like they are at the end of the towpath down the street. Seeing that the uranium was the largest air pollutant in Cleveland at the time, the surrounding areas right around the chemical plant would be most contaminated. It would be a shame if no radiological testing was done before building the complex that so many people use, young and old. This article delves more into the site closer to the plant. But Steelyard Commons is important because of its relevant location. With all the corruption that has just recently exposed alot of county and public officials; I wonder if a deal was cut in order to expediate the clean-up. If so that would jeopardize the health of the citizens of Cleveland. Workers at Harshaw had refined uranium for the production of atomic bombs during World War II — part of the then-mysterious Manhattan Project — leaving behind a microscopic-but-lethal legacy of their wartime work. More than 1,500 workers once refined uranium for atomic bombs. From 1944 to 1959, the company was contracted by the Manhattan Engineering District and the Atomic Energy Commission to refine uranium, which was then shipped to Oak Ridge, Tenn. The commission OK’d the site for “unrestricted use” a year later, but later reports showed that the company had discharged some 4,000 pounds of radioactive uranium-fluoride particles into the air each year and that that traces of uranium and other compounds remained in the buildings and soil on site, according to records. Eventually, federal authorities placed Harshaw in the Superfund cleanup program and paid out more than $5.5 million to former workers who were contaminated and their families. The Army Corps released its first assessment of Harshaw in April 2001, a more detailed investigation in 2006 (which revealed the presence of another radioactive element, thorium) and finally a 1,000-page update in late 2009. A summary of that report was shared with residents and public officials Jan. 20. A copy of the full document is on file at the Brooklyn branch of the Cuyahoga County Public Library, 4480 Ridge Road. Here is a map of the Towpath Trail proposed extension. It ultimately concludes that there remains “no imminent threat to human health or the environment” at the site, which is now used only sparingly by two other industrial landowners. HARSHAW CHEMICAL CO., a diversified industrial chemical producer, was founded by Wm. A. Harshaw as the Cleveland Commercial Co. in 1892 to deal in chemicals, oils, and dry colors. In the mid-1890s the company bought interests in several manufacturing firms, acquiring Ralph L. Fuller and Wallace B. Goodwin as partners, and formed the C.H. Price Co. in 1897 to operate a small linseed-oil mill in Elyria. In 1898 Cleveland Commercial and C.H. Price merged to form the Harshaw, Fuller & Goodwin Co. with glycerine-refining and electroplating operations in Elyria and headquarters in Cleveland. With William Harshaw as president, the company expanded its manufacturing operations, building a plant at 1000 Harvard Ave. in the industrial FLATS area and a glycerine refinery in Philadelphia during the early 1900s. World War I saw increased demand for the company’s products, and in the 1920s Harshaw improved and enlarged existing facilities and established an operation in New Jersey. The firm, selling over 1,000 different chemical products nationally, shortened its name to Harshaw Chemical Co. in 1929 and moved into new headquarters at 1945 E. 97th St. in 1930. Demand increased for Harshaw’s products during World War II, as it contributed to the atom-bomb project by developing uranium chemicals for the government. By 1949, Harshaw’s Harvard Ave. facility was one of the Manhattan Project’s largest makers of uranium chemicals. 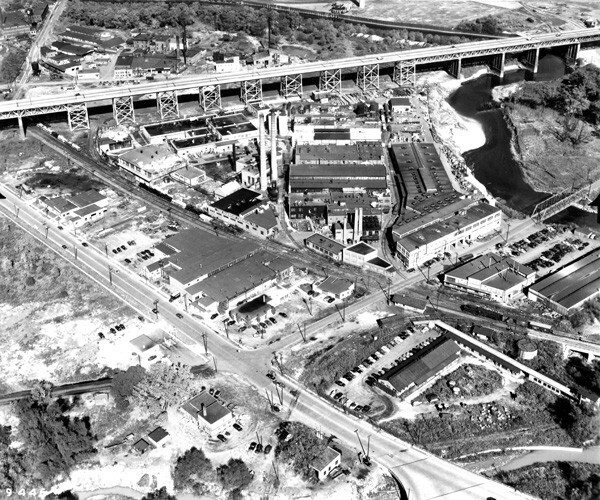 This business was not without risks and officials with the Atomic Energy Commission later reported that between 1942 and 1953, Harshaw released approximately 4,000 pounds of radioactive uranium-fluoride particles annually; making it, in the words of those officials, a “major contributor” to pollution in Cleveland. The company continued to grow after the war; sales were $60.8 million in 1955, with income of $2.5 million and 1,683 employees. In the 1960s the chemical firm contributed to the space program and to military technology utilized during the Vietnam War. In 1966 Harshaw merged with the Kewanee Oil Co. of Bryn Mawr, PA, and Kewanee in turn was acquired by the Gulf Oil Corp. in 1977. Gulf organized a joint venture with the Kaiser Aluminum & Chemical Corp. in 1983, combining their 2 chemical units into the Harshaw/Filtrol Partnership to produce specialty chemicals. After the merger, the firm moved its headquarters from E. 97th St. to 30010 Chagrin Blvd. in 1984, and just two years later the company employed 2,100 people and had revenues of nearly $264 million. In 1988, Kaiser sold the Harshaw/Fitrol partnership to Engelhard, a specialty chemical and metallurgical maker based in Oakland, CA. Increased scrutiny over sites of former contractors to the Manhattan Project led federal environmental officials to Harshaw’s production facility on Harvard Ave., which refined uranium between 1944 and 1959. Investigators discovered that the 40 acre site had high concentrations of hydrofluric acid and the site was added to a list already under study by the Department of Energy’s Formerly Utilized Sites Remedial Action Program in 1999. Oversite for the program soon shifted to the U.S. Army Corp of Engineers and in 2003, a review conducted by the Corp concluded that the radiological and chemical contaminants posed “no immediate health risk” to the general public. Although it has been largely cleaned up of its low-level radioactive waste, there is still ‘plenty’ inside Building G-1 and in the grounds and asphalt surrounding the complex. It is an eerie site, the abandoned buildings as they await clean-up (which may not begin until 2012). The white warehouse building on Harvard is supposedly completely safe, but right across the street, they used to dump depleted tailings there and is still somewhat contaminated. The Manhattan Project was a research and development program, led by the United States with participation from the United Kingdom and Canada, that produced the first atomic bomb during World War II. From 1942 to 1946, the project was under the direction of Major General Leslie Groves of the US Army Corps of Engineers. The Army component of the project was designated the Manhattan District; “Manhattan” gradually superseded the official codename, “Development of Substitute Materials“, for the entire project. Along the way, the Manhattan Project absorbed its earlier British counterpart, Tube Alloys. The Manhattan Project began modestly in 1939, but grew to employ more than 130,000 people and cost nearly US$2 billion (roughly equivalent to $25.8 billion as of 2012). Over 90% of the cost was for building factories and producing the fissionable materials, with less than 10% for development and production of the weapons. Research and production took place at more than 30 sites, some secret, across the United States, the United Kingdom and Canada. Two types of atomic bomb were developed during the war. A relatively simple gun-type fission weapon was made using uranium-235, an isotope that makes up only 0.7 percent of natural uranium. Since it is chemically identical to the main isotope, uranium-238, and has almost the same mass, it proved difficult to separate. Three methods were employed for uranium enrichment: electromagnetic, gaseous and thermal. Most of this work was performed at Oak Ridge, Tennessee. The Manhattan Project operated under a blanket of tight security, but Soviet atomic spies still penetrated the program. It was also charged with gathering intelligence on the German nuclear energy project. Through Operation Alsos, Manhattan Project personnel served in Europe, sometimes behind enemy lines, where they gathered nuclear materials and rounded up German scientists. In the immediate postwar years the Manhattan Project conducted weapons testing at Bikini Atoll as part of Operation Crossroads, developed new weapons, promoted the development of the network of national laboratories, supported medical research into radiology and laid the foundations for the nuclear navy. It maintained control over American atomic weapons research and production until the formation of the United States Atomic Energy Commission in January 1947. My interest in this was spawned by the Fukushima nuclear meltdowns. I knew these radioactive substances have half-lives in terms of 250 to 700 million years. But when these substances are not contained, even thou invisible, can do great harm to our health and the environment. This article is about one of many hotspots around the world. If nobody remembers the past, we will never know how it may be effecting our future. Since this is in my backyard, I’d figure to put my investigative curiosity to test. “But that does not mean there aren’t long-term health risks, depending on the land use,” said Jeff DeVaughn of private contractor Science Applications International Corp. of Twinsburg, which has overseen the investigation and cleanup since 2001. “If the land were to be used for a resident or a farmer — the most sensitive land use there is — with little kids running around eating dirt, the standard for cleanup is much higher. I would like to know what level of exposure is considered safe. Will signs be posted in the vicinity of the worst area. With half-life exceeding anything imaginable, we need to deal with this now. Because it looks like this stuff is here for a very long time. In footage of the NYC Press Conference May 4th 2012 | Cinema Forum Fukushima, Japanese Nuclear Scientist and Japanese and US medical doctors discussed current radiological health conditions and concerns in Japan after the Fukushima Daiichi nuclear reactor catastrophe. 4/7 Dr Andy Kanter, MD, MPH, on Press Conference May 4th 2012 from East River Films on Vimeo. From 1942 until the early 1950’s, Harshaw Chemical produced bulk amounts (hundreds of pounds each day) of uranium products and other inorganic chemicals. Uranium mills in the United States and Canada shipped yellowcake feed to Cleveland, where Harshaw Chemical purified and converted it to several types of uranium compounds, including orange oxide, brown oxide, green salt, and uranium hexafluoride. The company eventually became the main supplier of uranium hexafluoride to the S-50 and K-25 Plants and of purified hydrofluoric acid to the Hanford Reservation T Plant after World War II. Until the Feed Materials Production Center (FMPC) in Fernald, Ohio came fully on line in 1953, Harshaw Chemical consistently produced high quality uranium products and other inorganic chemicals for the nation’s nuclear weapons industry. In May 1953, the main plant went on stand-by, and the government began selling or transferring its equipment at the facility to other operations, particularily the FMPC. All AEC operations at Harshaw Chemical finally ceased in January 1958. Most of the company’s original buildings still exist, both at its former headquarters on 97th Street Chester Avenue (recently been razed) and at the chemical production plant about 3.5 miles south of downtown Cleveland. Harshaw Chemical’s headquarters building, an imposing black stonework edifice, housed the main administration offices and research laboratories. It is now ivy-covered and partially hidden behind large trees. The numerous vent pipes protruding throught the roof in the rear of the building indicate where the laboratory hoods were once located. Offices of the Chester Conference Center of the Cleveland Clinic Foundation now occupy the site. Most of the originial 30 buildings remain at Harshaw Chemical’s 14-acre plant site, hugging the western bank of the infamous Cuyahoga River. Harvard Avenue cuts trough the mostly red brick building facility, which appears lonely and isolated from the surrounding industrial sites and railroad yards by more than just its broken windows, 8-foot chainlink fence, and empty and overgrown surrounding lots. A security guard keeps trespassers away. The Englehard Corporation (BASF currently) currently maintains some of the old buildings in order to lease them for warehouse space. Concrete pads are all that remain of several others. The Refinery Building is a large red brick and steel structure with 1-, 2-, and 3-story sections, and a flat, tar-covered concrete slab roof. Most of the uranium work occurred here, although years after the plant shut down the DOE found 16 additional buildings on both sides of Harvard Avenue significantly contaminated with uranium (as well as traces of yellowcake along the riverbank). Maybe that is why so many of the Harshaw Chemical facilities still remain – the preliminary decontamination phase of their demolition is too expensive. Notice the Cuyahoga River how it gets pinched from the debris dumped into the river. Is this the yellowcake uranium that was dumped into the river? owned by the former Harshaw Chemical Company. No known process-related activities were conducted in IA-06. Historical information indicates this area was used for general construction debris fill activities. There are no buildings in IA-06 and a historical aerial photo analysis shows no evidence of past development. Small areas of land disposal are evidenced by vehicle tracks on a historical aerial photograph analysis and an area of slightly elevated radioactivity was identified during sampling activity. samples, but were not determined to be significant constituents of potential concern (COPC). Assessment for the current or reasonably anticipated future land use of recreational. and non-cancer risks from FUSRAP-related constituents are below the EPA risk limit both for current use and into the future. public meeting, input received from the community, and responses to the comments received. From the wording that is used in the report, it is presented as if radioactive isotopes that are carcinogenic are treated as candy, and cancer-causing is taken so lightly. Or were not determined to be significant constituents of potential concern (COPC). And ‘there is very little radioactivity above background levels’. When statements like ‘impacts above the drinking standard’, and ‘ none of these constituents were present at levels indicating that they posed an unacceptable risk to human health and the environment, i.e., they are not considered significant COPCs.’. To me it sounds like alot of suger-coating. I don’t believe that a thorough sampling of collected soil was adequate to get the full picture of what’s in the ground. In IA-06 for example, only 99 soil samples collected from 42 locations were analyzed. Every few feet will give significant variations of radioactive contamination. Their are still hot spots that have been over-looked. The company’s former administration offices and laboratories are located at 1945 E. 97th Street, between Euclid Avenue (U.S. Route 20) and Chester Avenue (U.S. Route 322), a little more than 2 miles east of downtown Cleveland. Although the neighborhood is mixed commercial and residential, street parking is non-existent within a block or two of the staely old building, and the parking lots of the numerous public buildings are “for customers only.” In any case, it is well worth the short walk to view Harshaw Chemical’s old headquarters and contemplate its historical role. Finding the chemical plant at 1000 Harvard Avenue is tricky for the first-time visitor. Look at a cty street map before trying to drive there. The three simplest approaches are from I-77 onto Harvard Avenue westbound, or from southbound I-71 onto Jennings Freeway and then immediately off at Denison Avenue, or from northbound I-71 onto southbound 25th Street (to thye right) and then east (left) onto Denison Avenue. Visitors can see the old chemical plant from ground level along Harvard Avenue. The best overview of the entire complex is from the Harvard-Denison Viaduct. A sidewalk along the southern side of this overpass enables visitors to inspect the Harshaw Chemical Plant at their leisure. Although Harshaw Chemical is only a few miles from downtown Cleveland, visitors should drive to the facility. A friend will help in navigating through the 3-dimensional maze of streets in this old industrial zone. The best street parking is available north of Denison Avenue at the western end of the Viaduct. Consider bringing a sweater because the Viaduct can be cold and windly. A friend told me you can’t change the past, change the future. My family is tired of me mentioning it anymore. So I thought I would bring it to ohio political persons to see what they had to say. Deafening silence. That is all I recieved from my facebook post to Dennis Kucinich Congressman of the 10th District in which Harshaw property rests. He’s been in Congress for 16 years, a Senator and been elected to Cleveland’s City Council at age 23. At age 31 mayor of Cleveland as well. Very strange, he had to have heard about Harshaw and the contamination of the area in which his constituents live and left it sitting their all those years and did nothing to raze it in a fashion that alerts surrounding neighborhoods and finally do away with one of the nation’s top polluted site. In the meantime, a dome should be put over the property until the property is properly cleaned and buildings dismantled. The alternate towpath around the property will not be complete until 2016. So that means until the razing is complete, the surrounding neighborhoods and beyond will encounter the radiological isotopes migrating from ground-zero. I e-mailed , local news reporters, no reply, Govenor Kasich, no reply. I even thought Carl Monday, Cleveland King of Investigation, no reply. The only person who responded was Betty Sutton, 13th District with a letter that her staff meets at the Community Office hours at the library. I met with them to discuss my concerns. Now there is new evidence on the dangers of low-level radiation. The Bulletin of the Atomic Scientists is casting new light — on the murky field of sizing up the health effects of small radiation doses. The publication’s May-June issue carries seven articles and an editorial on the subject of low-dose radiation, a problem that has thus far defied scientific consensus. Every day all over the world people are exposed to ionising radiation, almost all from natural sources in the environment or for medical reasons. Ionising radiation has enough energy to cause damage cells which can increase the risk of cancer later in life. However these risks to health are actually low and ionising radiation is widely used in cancer therapy. In general the health effects of ionising radiation are dependent on the dose received. While low doses increase the risk of cancer later in life, very high doses act like a poison and can be fatal. The 1999 NEXT Dental survey provided an insight into the practice of dental radiography. Among the extensive information gathered, the survey documented the number of films taken per visit, the types of film used by dental practitioners, and measures of patient exposure. For the 1999 Survey, the amount of radiation a person is typically subjected to for D-speed film was 1.7 milligray (mGy) (a unit of radiation exposure) per film, and 1.3 mGy for E-speed film. The types of film used by dental practices in this survey varied, with D-speed film comprising approximately 70% of the film used, E-speed film about 21%, and F-speed film about 9%. Radiation Dose Chart This is a chart of the ionizing radiation dose a person can absorb from various sources. The unit for absorbed dose is “sievert” (Sv), and measures the effect a dose of radiation will have on the cells of the body. One sievert (all at once) will make you sick, and too many more will kill you, but we safely absorb small amounts of natural radiation daily. Note: The same number of sieverts absorbed in a shorter time will generally cause more damage, but your cumulative long-term dose plays a big role in things like cancer risk. What is the effect of radiation? Radiation causes ionizations in the molecules of living cells. These ionizations result in the removal of electrons from the atoms, forming ions or charged atoms. The ions formed then can go on to react with other atoms in the cell, causing damage. An example of this would be if a gamma ray passes through a cell, the water molecules near the DNA might be ionized and the ions might react with the DNA causing it to break. At low doses, such as what we receive every day from background radiation, the cells repair the damage rapidly. At higher doses (up to 100 rem), the cells might not be able to repair the damage, and the cells may either be changed permanently or die. Most cells that die are of little consequence, the body can just replace them. Cells changed permanently may go on to produce abnormal cells when they divide. In the right circumstance, these cells may become cancerous. This is the origin of our increased risk in cancer, as a result of radiation exposure. At even higher doses, the cells cannot be replaced fast enough and tissues fail to function. An example of this would be “radiation sickness.” This is a condition that results after high doses to the whole body (>100 rem), where the intestinal lining is damaged to the point that it cannot perform its functions of intake of water and nutrients, and protecting the body against infection. This leads to nausea, diarrhea and general weakness. With higher whole body doses (>300 rem), the body’s immune system is damaged and cannot fight off infection and disease. At whole body doses near 400 rem, if no medical attention is given, about 50% of the people are expected to die within 60 days of the exposure, due mostly from infections. If someone receives a whole body dose more than 1,000 rem, they will suffer vascular damage of vital blood providing systems for nervous tissue, such as the brain. It is likely at doses this high, 100% of the people will die, from a combination of all the reasons associated with lower doses and the vascular damage. There a large difference between whole body dose, and doses to only part of the body. There are four measures of radiation that radiographers will commonly encounter when addressing the biological effects of working with X-rays or Gamma rays. These measures are: Exposure, Dose, Dose Equivalent, and Dose Rate A short summary of these measures and their units will be followed by more in depth information below. Exposure: Exposure is a measure of the strength of a radiation field at some point in air. This is the measure made by a survey meter. The most commonly used unit of exposure is the roentgen (R). Dose or Absorbed Dose: Absorbed dose is the amount of energy that ionizing radiation imparts to a given mass of matter. In other words, the dose is the amount of radiation absorbed by and object. The SI unit for absorbed dose is the gray (Gy), but the “rad” (Radiation Absorbed Dose) is commonly used. 1 rad is equivalent to 0.01 Gy. Different materials that receive the same exposure may not absorb the same amount of radiation. In human tissue, one Roentgen of gamma radiation exposure results in about one rad of absorbed dose. Dose Equivalent: The dose equivalent relates the absorbed dose to the biological effect of that dose. The absorbed dose of specific types of radiation is multiplied by a “quality factor” to arrive at the dose equivalent. The SI unit is the sievert (SV), but the rem is commonly used. Rem is an acronym for “roentgen equivalent in man.” One rem is equivalent to 0.01 SV. When exposed to X- or Gamma radiation, the quality factor is 1. Dose Rate: The dose rate is a measure of how fast a radiation dose is being received. Dose rate is usually presented in terms of R/hour, mR/hour, rem/hour, mrem/hour, etc. The table below presents the Q factors for several types of radiation. I believe that the site is not only contaminated but sacred also. Alot of people suffered and died from cancer from working and living around the plant. I understand that the war dictated the extremes we had to endure to win. I can’t believe that after 50 years it was left their to blow the uranium and who knows what else off the rooftops into the surrounding neighborhoods and cities, or wash into Lake Erie that quench our thirst. I’m hoping that the surrounding neighborhoods will be notified when the buildings come down. Bury the property and surrounding valley land in 50 feet of concrete. Leave a plaque that commemorates the legacy that Clevelander’s sacrificed. And write off that piece of property. It is not worth anybody getting sick anymore. Well to answer my own question whether the Towpath Trail at Cleveland Ohio Steelyard Commons is radioactive from the Manhattan Project? Yes it is, it’s just that the ‘EXPERTS’ believe that low levels of radiation are safe. I believe the whole area surrounding the Harshaw site has varying quantites and qualities of radiological isotopes dispersed all around the neighborhood. The problem is we can’t see what we are looking for with our eyes. The other problem is researching this story I now wonder if the Steelyard Commons area was ever tested for radiation contamination. If it was’nt tested, maybe a review test should be in order see if it is contaminated, and at what levels. Plans to connect the Towpath Trail through a plot of radioactive land south of Steelyard Commons have been ditched. Instead, officials are working on an ambitious multimillion-dollar detour that would finally connect the Harvard Avenue trailhead with the shopping area, and complete one of the last links in the 110-mile trail. The connector could be in place by 2016, nine years after the effort began. “We are on a plan called 9-B,” said Ohio Canal Corridor Director Tim Donovan. Eight previous proposals to connect the Towpath in that area were scrapped. The U.S. Army Corps of Engineers is studying the extent of radioactivity and how to clean it, but the task won’t be done any time soon, the corps project manager said. The eventual connector will loop around the contaminated property. Most of the route will be on county-owned land directly beneath the Harvard-Denison bridge and above existing train tracks, curving at each end to connect with the existing trails. A dead-end branch of the new section will allow users to walk or bike along the Cuyahoga River. OK, you may have had some valid points within your Video. But, unfortunetly you, like many others have done Nothing about updating facts. Like for instance that All of the Harshaw Buildings now have been reduced to rubble. And, when they were tearing down the plant the town you WRONGLY labled as a Cleveland neighborhood (Alpha, Beta, and Gamma) is Newburgh Heights, and we had fallout Gold/Brown dust from Harshaw’s demolition. And, to your Sick Joke comment. Please check facts before making comments. 1.) Newburgh Heights was formed in 1904. The Street Names Alpha, Beta, and Gamma Avenues all were named before WWII and the development of the Atomic Bomb. 2.) Newburgh Heights was the center of town for then Newburgh township (Pre-1904). If you look on old Western Reserve Maps, you will see that Newburgh Heights is only a small slice of what was Newburgh Township. The other areas that were part of Newburgh Township included: Part of Southeast Cleveland (Slavic Villiage), Cleveland Heights, Garfield Heights, Shaker Heights, and the Villages of Brooklyn Heights and Cuyahoga Heights. 3.) Newburgh Heights has its own Radioactive history unrelated to Harshaw Chemical. Chemtron (Now McGean-Rohco), had produced a powdered metal (Radioactive) for use in tanks to make dials glow in the dark. When they tore down the old processing buildings, they illeagally dumped the debris in a ravine near Bert Ave. in Newburgh Heights. In the 1990’s Residents near Bert Ave. Successfully Sued Chemtron’s parent company (Sunbeam-Oster) for over $500 Million Dollars in damages and clean up charges. If you look up Bert Ave. on EPA Superfund sites. This will be listed. Millions of dollars, still sit in a fund in case something (Flood, War, Terrorism) were to damage the containment cell around Isotopes deemed too Dangerous to move. Even Sewers were rerouted to prevent water from disturbing the cell. Maybe. I cannot guess at who knew what about Harshaw. I do know at least two people whom worked there. Both died at about 65-70 years old of Cancer. Both worked at Harshaw and lived in Parma. I do not know if you worked there when they did. But, one man lived 5 doors away from my dad. His Name was Frank Budzik.